Batteries may power our world and all of our favorite gadgets, but they are undeniably harmful to the planet. Bio-batteries – batteries that run on natural materials rather than dangerous chemicals – are a promising alternative for future generations. But so far, not many workable versions have really been developed. 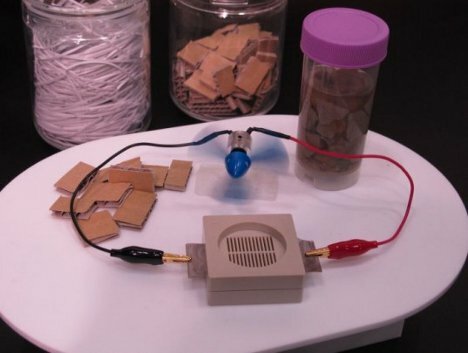 However, Sony recently threw their hat into the ring with a brilliant little battery that runs on cellulose and enzymes: the same system used by termites to get power from eating wood. 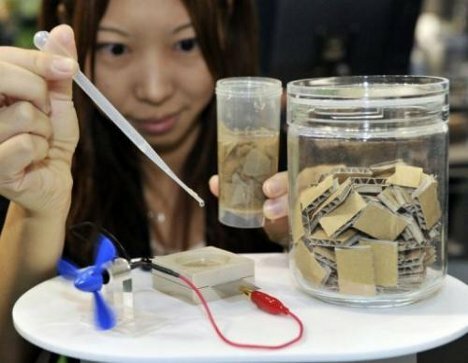 The system was displayed at the 2011 Eco-Products exhibition in Tokyo, where visitors were invited to “feed” the battery pieces of cardboard or shredded paper. The enzymes then went to work, breaking up the long chains of glucose found in the cellulose and producing small amounts of power – enough to run a small fan. Although the work is promising, it is nowhere near ready to replace our current batteries because of its low power output. But with enough development, a future without hazardous consumer batteries seems entirely possible.